Centerville Road combines great traditional and original bluegrass with some mighty fine picking and singing. Along with Red on mandolin and Chris on guitar, Casey Henry plays banjo on several numbers and shares the bass playing with our friend Mike Bub. Red's uncle John Hedgecoth contributes several banjo tracks and an original song of his own. Here's a variety of bluegrass music for you, guaranteed to please! Scroll down for Liner Notes. 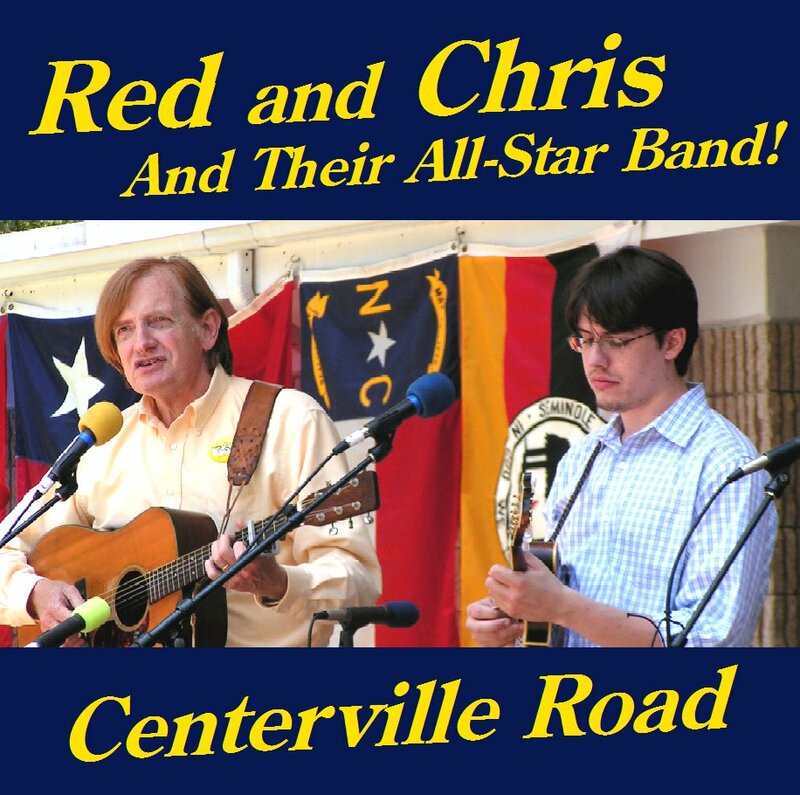 Red and Chris and Their All-Star Band are led by the father-and-son team of Red Henry, long-time mandolin picker and bluegrass performer, and his son Christopher, who at age 30 is already a veteran bluegrass picker and songwriter. They’re dedicated to playing original and traditional bluegrass with the hard-core feeling in it¬—that exciting sensation that comes from hearing a well-done bluegrass number. Enjoy their music. That’s what it’s for! 1. The Centerville Road is an old canopy road leading out of Tallahassee, Florida. The old Henry family farm was about three miles out of town. 2. Red and Chris present their bluegrass credentials with a song from the great Chubby Anthony, Baby, I’m Georgia Bound. John and Christopher recreate Chubby’s driving sound with their fiery breaks. 3. Walkin’ West to Memphis combines two themes: one, a propensity for running out of gas, and two, finding the way back to where one perhaps shouldn’t have left in the first place—or maybe he should, because it makes a good song! 4. Red and Chris team up for a twin-mandolin version of Chris’ tune Pelham. 5. My Heart is Welcome Here is a real song about wandering and returning. 6. The writers of Old Home Place, Mitchell Jayne and Rodney Dillard, wrote many more great songs including Never See My Home Again. Red’s mandolin break pays tribute to unsung Dillards mandolin great Dean Webb. 7. J-O-B is a fairly true and real song that came about from a relationship that had reached a crossroads and was waiting to see what happened next. 8. Sometimes you can’t beat a great three-chord song. Christopher sings When My Blue Moon Turns to Gold Again, with a father-and-son duet on the chorus. 9. Chris wrote Murphy’s Favorite Jig, which he and Red dedicate to their greatest musical inspiration, She is Red’s wife and Chris’s mom, well-known banjo player and teacher Murphy Henry. 10. Flatt and Scruggs’ popular Why Don’t You Tell Me So isn’t often played in its original key of F, where the song has an appealingly different feel and “bounce” from its usual modern key of G.
11. Many years ago, an early settler in West Florida met his doom in a watery wilderness now named after him, Tate’s Hell. The late Will McLean wrote this striking ballad which Chris sings, and we hear Will’s wonderful voice speaking at the end. 12. Back in the 1960s, when John and Red first attended the Florida Folk Festival, it was a magical place where fine musicians from several states came for a weekend of great picking. John memorializes all that in the Florida Folk Festival Song. 13. Ripe on the Vine is a true song about an excursion into the Bluegrass State. 14. Gettin’ Old was written when a young man had seen enough to write about a time when an old man’s life was prolonged into a lonely winter. 15. Roane County is a lonesome and traditional ballad that was learned from Bill Monroe. Roane County is near where the time changes in Tennessee. 16. When Red was growing up in Tallahassee, an old homesite on Calhoun Street was said to have belonged to CIvil-War Governor John Milton, who killed himself at the end of the war. Milton’s Ghost is dedicated to him. 17. Harbor of Love: Master songwriter Carter Stanley produced this rarely-heard gospel masterpiece long ago. Red first heard the song years ago from the Johnson Mountain Boys, one of the few groups ever known to perform it. 17. Poison Love is a little-known but superb barnburner from the Stanley Brothers long ago. 19. Chris’s tune Rocky Branch Jig commemorates a major waterway in north Georgia. He and Red play the tune as a father-and-son duet.